These terms and conditions, as may be amended from time to time, apply to all our services directly or indirectly (through distributors & partners) made available online, through any mobile device, by email or by telephone. By accessing, browsing and using the PortugalHomes.com website or our iPhone app through whatever platform (hereafter collectively referred to as the "website") and/or by completing our "My Portugal Homes registration form" or by filling in an "Enquiry form" (hereafter collectively referred to as the "Forms"), you acknowledge and agree to have read, understood and agreed to the terms and conditions set out below (including the privacy statement). Through the website, we (HARLAND & POSTON IMOBILIARIA LDA and its affiliate (distribution) partners) provide an online platform through which all types of real estate (for example Villas, Townhouses, Apartments, Land, Commercial Property, collectively the "PHomes"), can advertise their "PHomes" for sale, and through which visitors to our website can make such enquiries. By making an enquiry via a "Forms" through PortugalHomes.com, you enter into a direct (legally binding) contractual relation with the company and the information you provide will be taken as accurate and freely given and may be subject to treatment for promotion, statistical purposes, and services directly or indirectly related with the estate agency activity. PortugalHomes.com and its offices will not commit to answer to all the requests of information, but according to its capacity will endeavour to provide the appropriate answers. Please note that we will use the information we gather with the help of our partners, be that Google, Rightmove, Zoopla, Onon or others, to help conclude a sale. We do share our enquiry - member data with third parties, be that currency brokers or again Google or others to help our promotions. 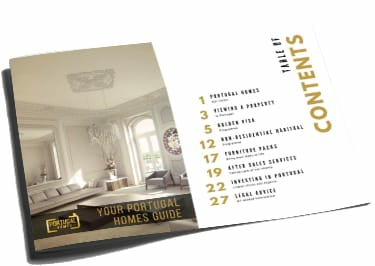 The copyright in this website and its content belong to PortugalHomes.com. The copyright and all other intellectual property rights in this Site (including all database rights, trademarks, service marks, trading names, text, graphics, code, files and links) belong to us or our licensor(s). All rights are reserved. This Site may contain links to websites operated by third parties. We have no control over their individual content. We, therefore, make no warranties or representations as to the accuracy or completeness of any of the information appearing in relation to any linked websites. The links are for your convenience only. We do not recommend any products or services advertised on those websites. If you decide to access any third-party website linked from this Site, you do so at your own risk. This website contains links to third party websites over which PortugalHomes.com has no control. We assume no responsibility for the content of third party websites or for any losses which may arise out of use of a third-party website. The presence of a link to a third party does not necessarily mean that PortugalHomes.com endorses that site or has or has not any association with the proprietor of that website. To receive further details of properties on this Site, you must submit a completed registration form to us. At our discretion, we may refuse your application for registration. If we accept your application for registration, we will confirm this by sending you an email containing registration info. By registering on our website and providing your personal information (name, telephone, e-mail) this data will be treated and can be used by PortugalHomes.com for promoting purposes and you can be listed on marketing tools (newsletters, etc) and we can contact you directly or may forward your contact for other entities, with your consent, to contact you. Whilst we take every care to ensure that the standard of this website remains high and to maintain the continuity of it, the Internet is not always a stable medium, and errors, omissions, interruptions of service and delays may occur at any time. As a result, we do not accept any ongoing obligation or responsibility to operate this website (or any part of it). We may put in place such systems as we from time to time see fit to prevent automated programs being used to obtain unauthorised access to our system and this Site. You are not permitted to use automated programs for such purposes and any such use or attempted use by you of such automated programs is at your own risk. Subject to the clauses above, we shall not be liable to you for any consequences arising out of or relating to any such use or attempted use of automated programs to obtain unauthorised access to our system or this Site. - Use of or reliance on any content or information displayed on our Site. All notices shall be given to us, by email at info@portugalhomes.com or by post to our address provided at the beginning of these Terms.